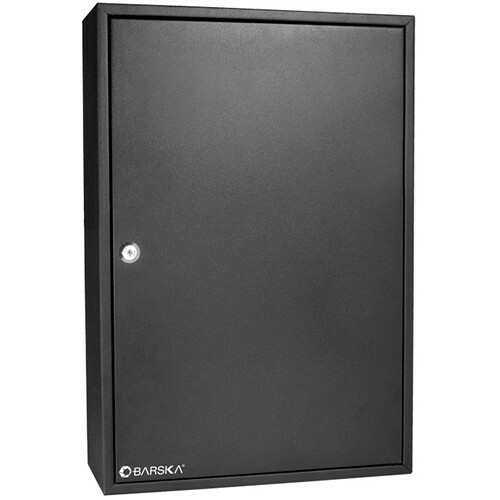 Exterior Size: 14.75 x 5.5 x 21.75"
Secure up to 200 keys and keep them organized with this 200-Position Key Cabinet with Key Lock from Barska. It offers 50 color coded and numbered key hooks and comes with an index chart with a plastic holder that can help you quickly find keys, or as a log sheet. The cabinet is strong with a 0.8mm-thick steel construction and measures 14.75 x 5.5 x 21.75". Four pre-drilled mounting holes and included mounting hardware make it easy to attach to a wall. Additionally, it comes with a backup key. Box Dimensions (LxWxH) 24.1 x 17.5 x 8.1"